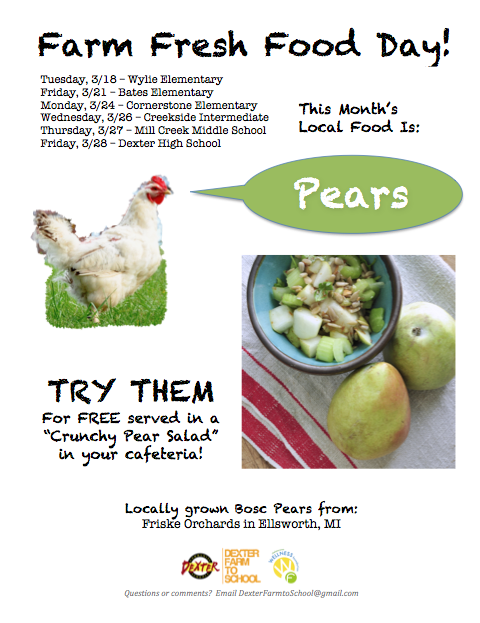 This month we will be sampling PEARS from Friske Orchards in a fresh pear salad recipe! Dexter Food and Nutrition will be getting new salad bars into Wylie and Creekside sometime this April, so we are working to introduce a few new items that could go on the salad bars from local farmers. We’ll try out a Crunchy Pear Salad with pears, celery, pineapple, and sunflower seeds.